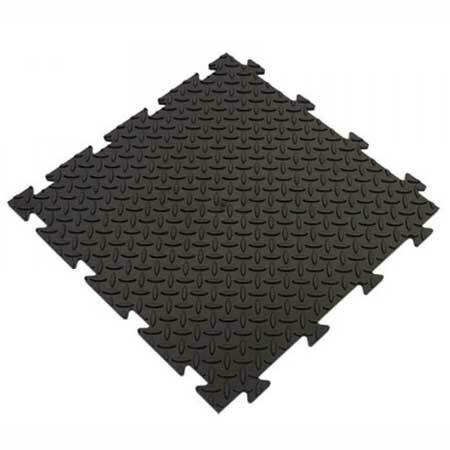 Black 485mm x 485mm x 10mm thick checker plate studded pvc floor tile. Each tile has two adjacent sides with female connection cutouts and the opposite two adjacent sides have male connection cutouts. Create a seamless floor for garages, workshops, work area's around machines or entire factory floors using the continuous design of the floor tile. Simply lay on a smooth surface and knock together using a rubber headed mallet. 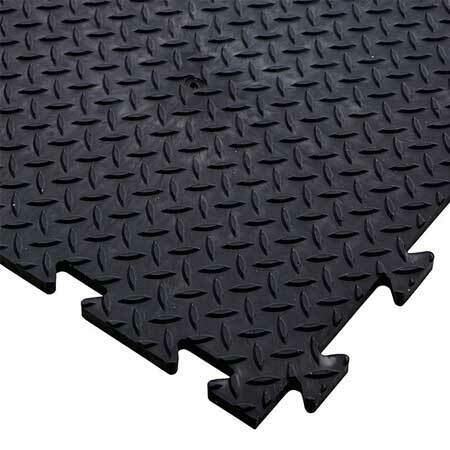 Anti-slip, anti-fatigue, easy to lay, easy to move and easy to cut to size. manufactured from 100% recycled pvc.